You can use the Edit Field window to edit any text field in any action. Press <F2> to invoke it. It is particularly useful for multiline text, text with variables or other long values. In the main editing area (top left) you can freely edit the value of the field. Press <Enter> to enter carriage return/linefeed characters. The Evaluation area below shows the current evaluation of the text, by substituting in the current values of all variables. The Word Wrap checkbox changes the display so that long lines of text are not automatically wrapped. It does not modify the value of the field, but may be useful if you are working with preformatted text. The Font selection box lets you choose a different font to display the text with. It has no effect on the value of the field. It may be useful when dealing with text with foreign characters. If you are working with preformatted text, you may wish to choose a fixed width font such as Courier New. 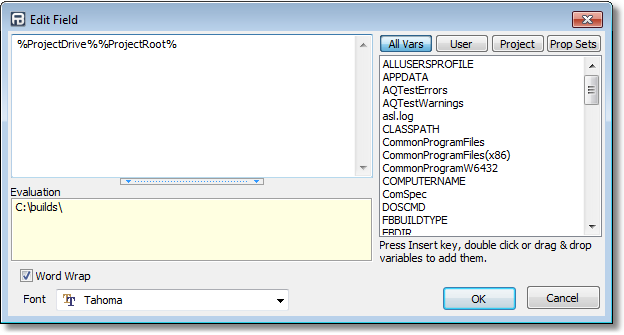 To add a variable reference to the current value, type % and the first few letters of its name. Once the correct variable is highlighted in the list on the right, press <Ins> to complete the reference. You can also drag and drop variables or double click them.